Looking for a garden centre near Roscommon? Gardeners, new and seasoned, in the county trust our garden centre near Roscommon, thanks to the endless variety of products and the quality of service we deliver. We have maintained these standards for 40 years now and we aspire to be your favourite nursery near Roscommon in future as well. Our garden centre has everything you will need for your garden – come over and see for yourself. We have a huge range of products awaiting you in our displays. They will excite you to do everything in your garden that you wanted. Read on and see what you can get from Fernhill Garden Centre on your visit and on the website. Garden Plants: Plants are the life and soul of a garden. Those beautiful flowers, overhanging foliage, the endless combinations of scents, and the lush green of them all together is truly mesmerising to anybody who loves nature. We have all kinds of plants in our nursery for your garden. Whether you want to grow something to eat, make organic medicines, or cover your plot (and even a wall or two) with the greenery, we have what you need. Ornamental Plants: Ornamental plants are those that are grown for the beauty they produce, usually in the form of flowers and gorgeous stems or leaves. Flowering plants come in many forms and types, and we have virtually all those suitable for England’s climate available in our nursery. There are the generous perennials, like Goldenrod, that bloom in their season year after year; there are annuals who are exceptionally gorgeous, like Daisies, but bloom only once in their life; there are bulbs, like Tulips, which are known to bloom in all seasons and can be annuals or perennials. 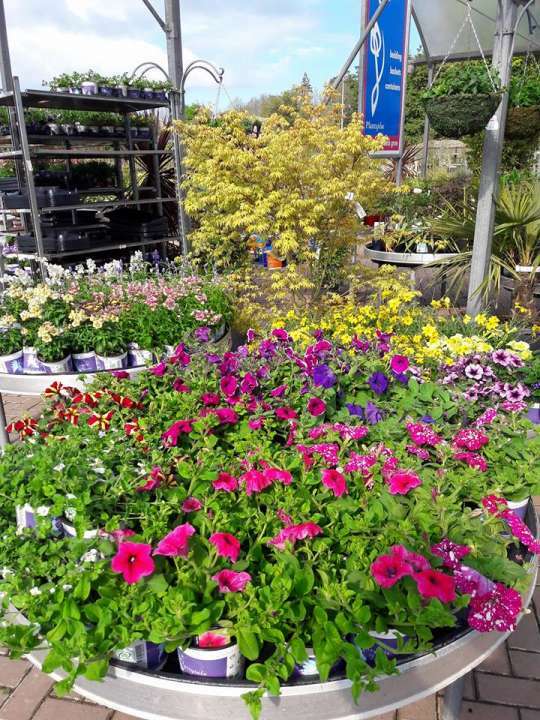 Visit our garden centre near Roscommon and take home your favourites. Edibles: Some gardeners like to grow their vegetables and fruits. If you are one of them, you will find our nursery near Roscommon filled with options. We have a big variety of grow-your-own plants near Roscommon. From roots like potatoes, onions, and carrots to melons, apples, peaches, and many other plants with edible produce, we grow them in our nursery for customers like you. They come in all sizes, too – from seeds and seedlings to plants and even grown trees. Indoor Plants: Houseplants allow you to take the beauty and benefits of nature into your rooms. Our stock of indoor plants near Roscommon is full of variety so you can take home many types of cacti and ferns, if you like succulents, or other ramblers and climbers that grow out of sunlight. Health & Skincare: We also have a wide range of plants with medicinal value. These include shrubs and herbs of many kinds that we grow in our garden centre near Roscommon. A lot of customers request special herbs and we grow those for them especially. Make your wish! Roses: Rose is the undisputed king of flowers, as far as most people are concerned, and this claim has a lot of merit. Roses catch the eye of everybody around them. Their uniquely set petals, exquisite hues, and wonderful fragrances combine to produce a rare effect of beauty. Fernhill Garden Centre has tens of kinds of roses near Roscommon – in terms of colours, plant types, and flower types. We have climber roses, groundcover roses, hybrid roses, and many others in our stock. Trees: If you want to give your new garden the look of an old one, with all the wonderful styles of a forest, plant a few grown trees in it. We have many types of trees available in our nursery near Roscommon. These include architectural trees, ornamental trees, fruit trees, and trees with unusual bark and stem. Pots & Containers: We have a wide range of plant containers available in our stock as well. They come in many sizes and shapes so you can pot your plants exactly how you want to and grow any kind of plant in a container with the perfect dimensions. You can get the best plant containers near Roscommon and liven up your driveway with a line of colourful potted plants on both sides. And why would you not! Garden Clothing: Gardeners are quirky folks. They love their routine and they like everything just right, even a dreadful selection of clothes. However, if you are looking for the right kind of garden clothing near Roscommon, you will find plenty in our nursery. We have boots, gloves, coats, jackets, and caps for dry season as well as rainy summers of England. Soil & Compost: We also have a variety of topsoil, composts, and fertilisers available in our garden centre near Roscommon. With topsoil of great quality, you can grow healthy plants even if the lower layers have ordinary soil. Similarly, organic compost can add to the nutrition in your soil many times over, and everybody knows how good fertiliser can change the course of a poorly growing plant. You will find the best quality fertilisers near Roscommon in our nursery. Hand Tools: You need proper garden tools to do your tasks well. Every exercise in the garden asks for a particular set of tools. This is why we keep all kinds of hand tools near Roscommon in our inventory. Our stock is sufficient to fulfil the needs of beginners as well as advanced gardeners and allow you to tend to all your gardening exercises properly. Pest Removal: Removing pests from your garden is a necessary part of a gardener’s life. You have to make sure your plots, plants, and lawn are clean of vermin of all kinds. We have a number of products for this purpose and you can choose your weapon of choice for pest control near Roscommon within our range of products. Weather Protection: You also have to protect your garden from unsavoury weather, particularly in the summer when British gardens get torrential rains at times. We provide a range of products for complete garden protection near Roscommon. The most popular among them are cloches, which do the job rather splendidly. Other materials and products are also available for weather protection. Watering: Your plants cannot survive without water but, at the same time, giving them too much of it can be injurious. Furthermore, depending on the shape and nature of the plants you grow, you have to ensure drainage on variable levels as well. We maintain a big stock of different sizes and shapes of watering cans near Roscommon with varying volumes. We also have branded automatic electric-powered watering systems available for your garden. Power Tools: While hand tools come very handy in the garden, there are times when you just need something bigger, more efficient, and more powerful. We keep all kinds of electric- and petrol-powered garden machinery, like chainsaws and lawnmowers, in our stock. With such a stock of power tools near Roscommon, you can easily get the right equipment for your gardening needs. Hard Landscaping: Be it fencing of your plot, paving the driveway, building an eating deck, or creating a pond, we have your hard landscaping near Roscommon covered with our expert designers, planners, and labourers. You can also purchase all kinds of materials and accessories for your landscaping project from our stock if you want to try it yourself. Garden Cooking: Cooking out in the garden can be a wonderful way of inviting your friends and family for quality time, a delicious meal, and some bragging about your wonderfully growing garden. With the right outdoor cooking equipment, you can organise a great steak party in the summer, and we have the perfect compact and huge barbecues near Roscommon available as well as bigger, complete outdoor kitchen setups along with various accessories for your barbecue sets. Outdoor Furniture: When you have guests over for your garden parties, you need enough furniture to entertain them comfortable. In our stock of outdoor furniture near Roscommon, we have large sofa sets, bistro sets, duet sets, garden chairs, tea sets for multiple guests, and many other items available. Our outdoor beanie bags are already becoming a favourite of garden owners in Roscommon. Gifts: Our nursery near Roscommon also has a special section for gifts. These are mostly gardening related items that you can present to somebody starting up on the hobby or already an avid gardener. If you think they would prefer buying their own gift, you can get them a gift voucher that comes in a pretty greeting card. Pets: We also have many items in our stock for your pet. Whether you have a fish, a cat, a puppy, or a bird, we have the bedding and feed to keep them healthy, rested, and happy. Our stock of pet care near Roscommon is ample for all these domestic pets. Apart from variety, we also take pride in quality of our products and services. We are picky with the brands we bring onboard and test their products beforehand. We also make sure we only add those manufacturers in our suppliers who are trusted by gardeners around Britain. Similarly, we aspire to deliver the most value to our customers. In this regard, we have opened a webshop so that customers from further parts of the country can buy our products without having to drive to us for hours. Once you have placed your order, we can deliver it to any part of Ireland with nothing over standard service charges depending on the weight and dimensions of your merchandise. We also have experts available in our premises during business hours every day. So, when you next visit us, bring your questions about what products would suit your needs best and about how to grow your gardening skills steadily. Come visit our garden centre near Roscommon and get the best products in the county.